Dr Pradeep Chowbey has operated on many VIPs during his long career and reveals what it is like to deal with some of the nation’s most powerful people. New Delhi: He’s the honorary surgeon to President Ram Nath Kovind and has served four of his predecessors as well. 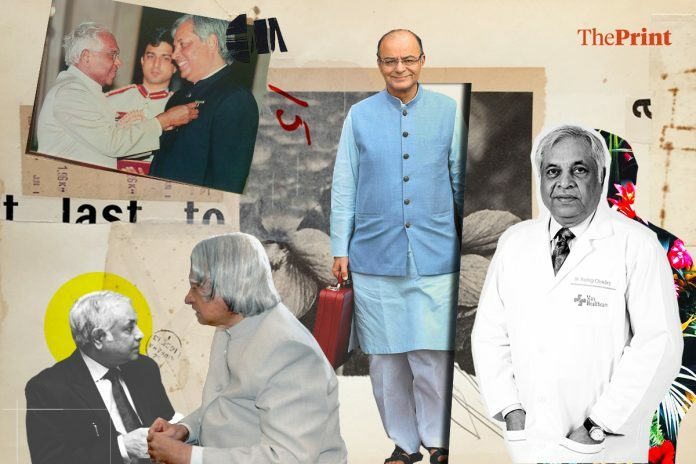 His patients include Finance Minister Arun Jaitley, former president K.R. Narayanan, spiritual leader Dalai Lama, governors and politicians. But Dr Pradeep Chowbey wishes his patients would be more open if they’ve undergone procedures such as bariatric surgery, so that it increases awareness. “Many times VIPs are operated on but they will say I am only drinking soup, and have been working out five times a day,” the surgeon, who performed bariatric surgery on the Finance Minister, says. “Somehow I feel that I would not have much respect from them. I want people to know of this surgery, and that it is a life-saving surgery,” he says in an interview at his plush South Delhi residence. Bariatric surgery is a procedure through which the amount of food that can be stored in the stomach is restricted through different means. It is usually performed as a weight loss measure, but can also be used to control obesity-related conditions such as diabetes. Dr Chowbey says there are many high-profile patients he has operated upon, but never spoken about. And he says he’s not dropping names unless the patients themselves reveal it to the world. Dr Chowbey says initially there was very low acceptance even for laproscopic surgery in India, despite its obvious benefits for the patient. But it changed after he performed the surgery to remove gall bladder stones from President K.R. Narayanan in 2001, people and the medical fraternity were open-minded about it. “After that no one asked me if a conventional gall bladder surgery should be done or whether it should be laproscopic. That day sealed the debate,” says the surgeon, who was in Delhi’s Sir Ganga Ram Hospital for almost 29 years. People figure that if a high-profile patient like the President is getting a surgery done through laproscopy then he must have done his due diligence, he says. It’s similar with bariatric surgery. “People feel that they (VIPs) have done their homework,” Dr Chowbey says. Among those who’ve openly admitted to getting a bariatric surgery done include Union minister for highways Nitin Gadkari and Finance Minister Jaitley. Some estimates say upto 15,000 bariatric surgeries were performed in India in 2016, and one report says there are almost 100 surgeries performed a day across the country. Dr Chowbey studied in Jabalpur Medical College and started out as a surgical oncologist, before becoming one of the first laparoscopic surgeons in India. And despite having a high-profile list of patients over the decades, he says it’s not the patients that stress him out: it’s their associates and ‘so called celebrities’. “First of all, there’s name dropping. Another thing we see is that a person who is least concerned, will be the most vocal and try to throw his weight. They will try to show they are intimate with the VIP,” he says. And then there are calls and ‘concerned’ people. “It is in these cases that people walk into your office and you get a telephone call asking to know something about them,” he says. Dr Chowbey, who is presently Chairman of Max Institute of Minimal Access, Metabolic & Bariatric Surgery, says he maintains the strictest confidence in cases involving VIP patients, revealing details of a case only to a person specifically designated by a VIP patient. He also says political leaders are often more perceptive of their doctors and don’t put undue pressure on them. “I feel more concerned when I am dealing with these so-called celebrities who may not have an understanding of the subject but would like to pressure you,” Dr Chowbey says. Dr Chowbey, who says his biggest stress reliever is art, says he has never worried about operating on high-profile patients. But sometimes there are rather unique protocols for them that he has been briefed about. “When the President is under anaesthesia, then who takes over? Unlike the US, where the Vice President takes over, here it is the Chief Justice,” he said in the interview conducted in his south Delhi residence with his Jack Russel terrier sitting at his feet. “Also you have to ask the President when they would like to be operated, you can’t decide the schedule. You can’t do any other surgery before or after it so that you can concentrate on it,” he says. Of course exceptions have to be made. On one occasion two governors had to be operated upon on the same day despite it violating protocol. Luckily it was resolved after one of them decided that the more senior one should be operated first. Do VIPs obey doctors’ orders? The surgeon says that he’s just as strict with his high-profile patients but adds that instructions aren’t always followed. In one case a patient he refers to as a ‘so called celebrity’ got food poisoning after the surgery, while another prominent patient got pneumonia after taking part in several public meetings. “By and large, they follow instructions. They are also concerned about their health, performance and longevity. Anyone who is a VIP would like to continue in that position and post. They don’t want to let it go due to health reasons,” he says.